Matte black and acetate temple. Signature T insets at temple. Non-optical demo lenses (replacement is suggested). Barton Perreira "Doyen" aviator optical frames. Filigreed titanium geometric frames. Antireflective mineral glass lenses. Double nose bridge. Slim temples with logo embossing and bulb tips. 100% UVA/UVB protection. Can be fitted with prescription lenses. Made in Japan. 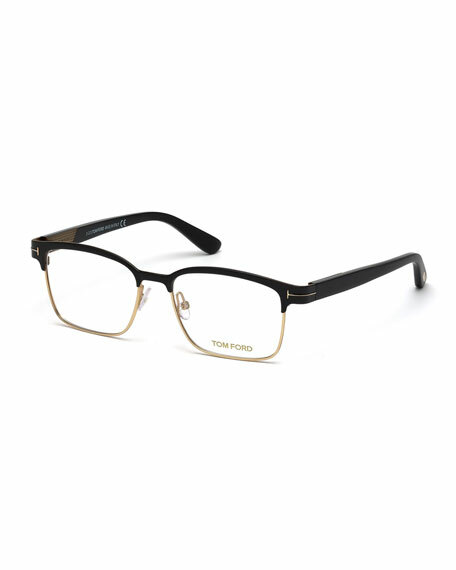 TOM FORD oval optical glasses frames in shiny acetate. Lens/bridge/temple (in mm): 48-22-145. Ready-to-wear clear lenses enhanced by a blue coating able to reduce the risks related to blue light exposure. Signature "T" through temples. Keyhole bridge. 100% UVA/UVB protection. Made in Italy.